James Croston informs us that the New Town Hall in Manchester was designed by Mr Alfred Waterhouse and that "the foundation stone was laid on 26th October, 1868, by Mr. Robert Neill, the then Mayor." This view shows the principal approach to the first floor and a traceried stone screen in the landing. 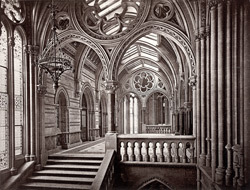 "The style of architecture is Gothic, presenting many of the characteristics of the Early English period, or late thirteenth-century work, but so freely treated as to be rather an adaptation of the medieval to the requirements of the present age...The ground floor, to which there are four public entrances, is occupied by the offices of the City Treasurer, the Consolidated Stock, Police, Gas, Water, Hackney-coach, Nuisance, Markets, Highways, Building, Sanitary and Health departments, also the offices of the local Court of Record."